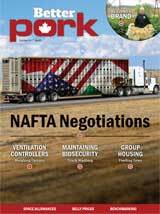 Better Pork October 2017 edition features the following articles: NAFTA Negotiations, Ventilation Controllers - Weighing Options, Maintaining Biosecurity - Truck Washing, & Group Housing - Feeding Sows. 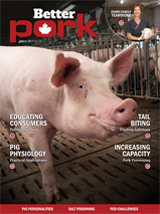 Better Pork August 2017 edition features the following articles: Educating Consumers - Telling Our Story, Tail Biting - Finding Solutions, Pig Physiology - Practical Applications, Increasing Capacity - Pork Processing. 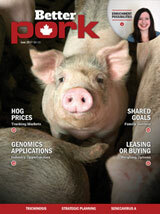 Better Pork June 2017 edition features the following articles: Hog Prices - Tracking Markets, Genomics Applications - Industry Opportunities, Shared Goals - Family Success, Leasing or Buying - Weighing Options. 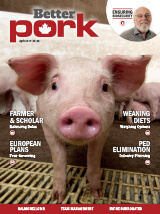 Better Pork Magazine April 2017 edition features the following articles: Farmer & Scholar - Balancing Roles, European Plans - Free-farrowing, Weaning Diets - Weighing Optins, and PED Elimination - Industry Planning.